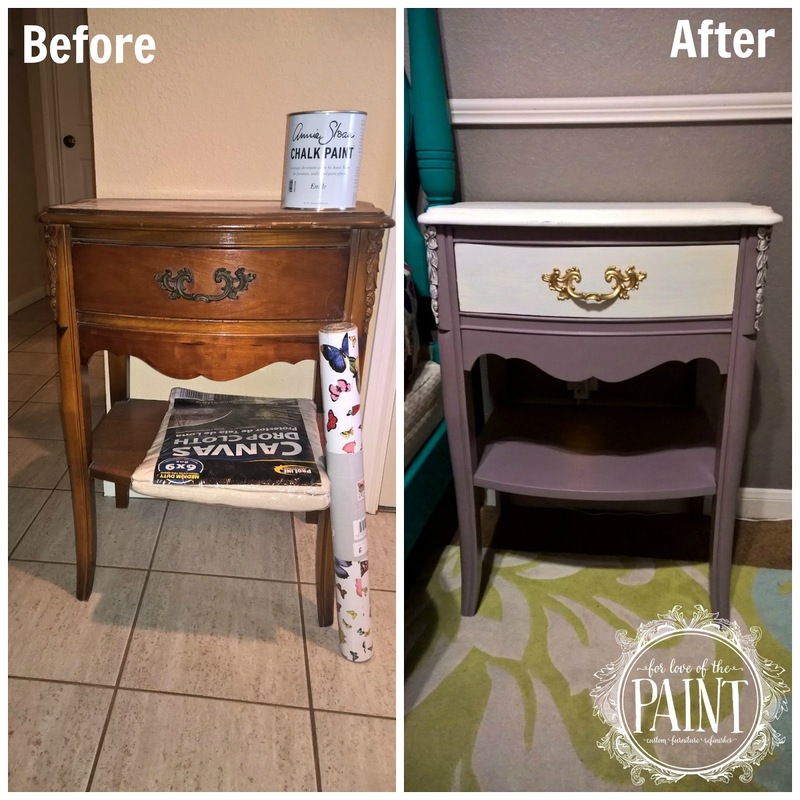 For Love of the Paint: Before and After : Vintage French Provincial Nightstand in Emile and Pure White - with Tutorial! Before and After : Vintage French Provincial Nightstand in Emile and Pure White - with Tutorial! First of all, a huge THANK YOU to everyone for all of your support! Finished pieces have been flying off the shelves at Red Door Lane, and I have a steady flow of custom orders for which I am so honored to have been selected! Thank you for letting me be a part of your homes and lives. We have had such an influx of work that I have begun to group projects together to maximize my efficiency. It still takes a number of hours to hand-paint each and every piece, but this way I can get just a little more done in a day. 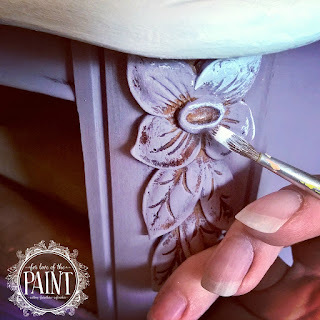 For instance, I am working on a beautiful antique French end table refinish with the top painted in Annie Sloan Emile Chalk Paint. (Update: see that finished project HERE). My daughter also needed a nightstand in her bedroom, and absolutely loves all colors (she comes by this honestly). So while the paint can was open, I worked on the two side by side - you will probably see many more of these "project pairs" in the future! I will also be adding more DIY and home projects as they come to fruition. I found a fantastic French Provincial set a few weeks ago, and realized that the nightstand was perfect for my daughter's room! (The other pieces are still available!) 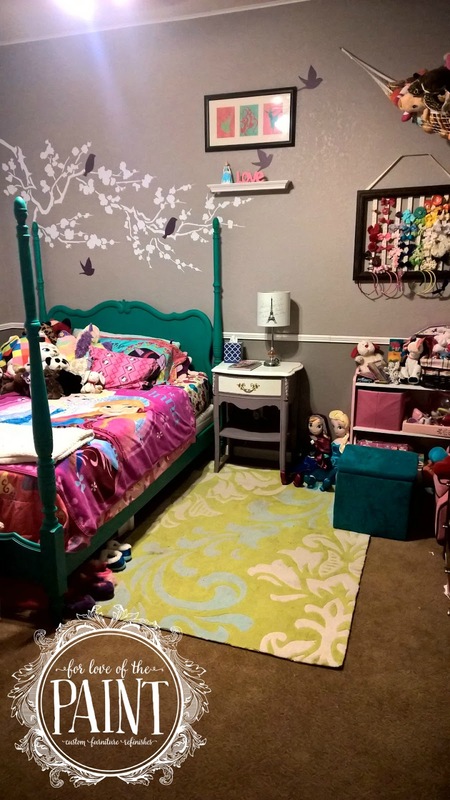 So what better to surprise her with than her very own custom painted big girl furniture? Want to see how I got this look? Click below to continue reading! 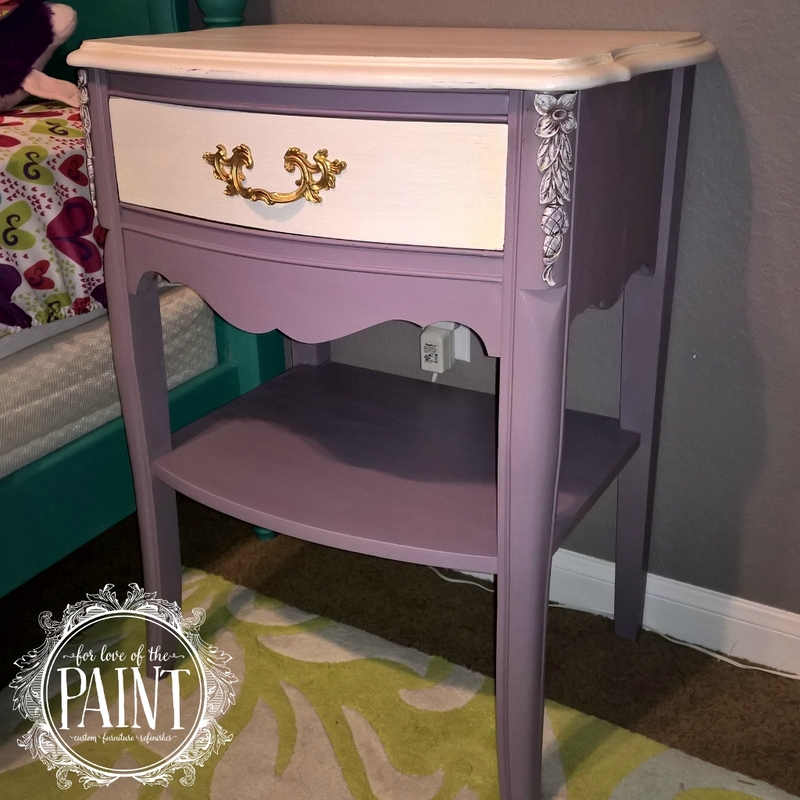 I used two coats of Annie Sloan Emile on the body and Pure White on the top surface. 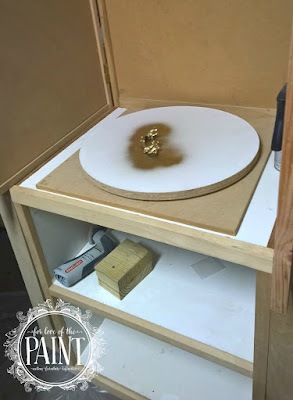 I let a little wood grain show through the white - for a more opaque finish I would have used three coats on any of the lighter colors (Old White, Old Ochre, etc as well). I knew I wanted a slight nod to the shabby chic look, so on the carved floral detail I used a not-quite-saturated brush with only wet tips of the paintbrush and very lightly brushed over with Emile. This left a hint of the original wood finish showing through in the recessed areas of the wood (LOVE!). This was similar to a dry-brushing technique, but I did use a little bit of a wetter brush to push the brush at an angle up behind the flower petals / trim, then came back over with smooth strokes to even it out. I then came back and lightly brushed on Pure White over the trim details. This is the absolute best part for me! Possibly because it's a little bit of instant gratification... the effect is apparent and gorgeous immediately as you work! When complete, I gently sanded just the edges of the top and drawer for a nod to shabby/vintage chic. I sealed the whole piece with Pure Earth Paint's Diamond Coat in a matte finish since it is super durable and quick to dry. The hardware was a beautiful traditional bronze, but my daughter loves shiny gold (her whole room would be bright shiny gold if we let her) so I wanted to give her a fresh accent on the nightstand. I used Rustoleum in my fancy new spray paint booth with lazy Susan built by my fabulous mother in law. This was its inaugural run, and it turned out fantastically! Isn't it sweet? I think it is a little shabby chic - meets nautical - meets modern vintage! Here's the nightstand in place with the rest of the room! (This room brought to you by practically every DIY Pinterest project ever, and one vinyl wall decal!) French provincial 4 poster bed refinish can be seen here. Questions on how I put together any of these pieces? Email me or comment below!